An academic year abroad is an unforgettable experience one will treasure always. If such programs were a universal requirement in the education of every student, the incidences of political, ethnic, racial and religious intolerance could be dramatically reduced. Total immersion in a foreign culture tends to broaden one's perspective and foster understanding of our global brethren. On the following pages, you will find listings for 177 institutions and organizations offering study abroad programs in France. The majority of these are sponsored by colleges and universities throughout the U.S., in addition to a number of independent organizations and agencies, a few of which are based in France. Finally, four of the listings represent programs for students at the secondary school level (AACE, AFS, Choate Rosemary Hall, and School Year Abroad). Nearly half of the schools represented offer programs in Paris, while the remainder are distributed in cities throughout "provincial" France. You may wish to check the list below first, to see if your preferred institution offers such a program. Then click on the alphabetical links to take you to the appropriate page offering complete addresses, phone numbers, and  in many cases  e-mail and web site links. 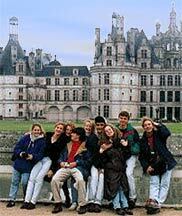 The CSIET Advisory List contains information about 64 international youth travel and exchange organizations. Each organization's listing includes: countries served, brief program descriptions, cost estimates, financial aid opportunities, and complete contact information. The Council on Standards for International Educational Travel (CSIET) is a private, not-for-profit organization which establishes standards for, monitors, and disseminates information about reputable international youth education and exchange programs. CSIET's annual publication, the CSIET Advisory List, contains information about programs which have been evaluated and deemed to meet CSIET's national standards. The Advisory List is annually distributed to all the high schools in the United States, and hundreds of parents and youth who are seeking interesting and reliable travel and exchange learning opportunities. Amer. Academic & Cult. Exch. Foreign Language Study Abroad Svc. Former U.S. Secretary of State Hillary Rodham Clinton expounds on the merits of studying abroad, plus other related videos.